The way I see it, the word “Happy” is strategically placed in front of most named holidays during the year (forgive me for stating the obvious). Think about it…Happy Thanksgiving, Happy Holidays, Happy Birthday…Happy Nurses Week…I could go on forever. Were any of these holidays actually declared with the intention of making you feel un-happy? Of course not! It doesn’t get much better than when you bring the four “F”s together: (1 & 2) Friends and Family (leaving out the potential stress factor that is), (3) Fun (whoever said charades is boring needs wake-up call) and (4) Food (probably my favorite part about the holidays—with a cherry on top). Now—to throw a curve ball at my little acronym—make your holidays even “happier,” by making it healthy! Below are just a handful of healthy tips for a Happier Thanksgiving…and don’t hesitate to leave a comment and let us know what type of healthy tips you practice during the holidays! 1) Eat a good, hearty breakfast. By skipping breakfast, you are more likely to indulge later and overeat…your body is hungry! Oh, and the whole idea that by skipping a meal you can make it up with an extra scoop of ice cream on your homemade apple pie with that mmm so good brown sugar crumble on top is not an ideal direction to take…although it does taste good. 2) Have company at dinner. By having company at dinner, you are more likely to eat slower. Among the chitter-chatter and family banter, you will be eating slower, taking smaller bites, and soon enough you will realize you’re full! 3) Serve yourself what you will eat. Don’t fill your plate up like a kid on Halloween when they get to the house with the “Please Take 1” bowl. Really? Please take one? If you’re anything like me, there are times when you are full but there is still some food on your overfilled plate. In some fantasy land out there that shouldn’t be a problem…but in real life—it is! How often do you find yourself picking at the rest of your plate…I mean, it’s in front of you, so why not? By filling up your plate with what you can and will eat, you can try to avoid this type of situation. 4) Drink water. We’ve all heard it before. This Thanksgiving let’s put it into practice. 5) Exercise at some point before THE MEAL. Not only will exercise make you feel less guilty about the gravy you just poured all over your place (yes it tastes good on everything I swear), but it will also boost your mood J. 6) Take a walk after THE MEAL. If the turkey hasn’t already put you to sleep, take a little walk after you eat. 7) Wear UA Thanksgiving Scrubs. Okay, this one may be a little unconventional, but you sure will get some good laughs and smiles from people who see you sporting your festive Thanksgiving scrubs around the house or while cooking! 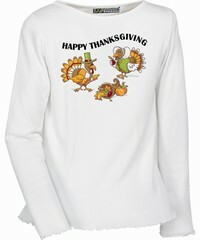 Plus, they are easy to clean so you can avoid a fashion disaster on your cleverly picked out Thanksgiving outfit. Is it just me or while aprons are meant to keep your outfit clean, do you often find that some red sauce or chocolate (why they both spread like wildfire boggles my mind) magically made its way directly thru the apron onto your clothes.